Arrange chips in single layer on platter. 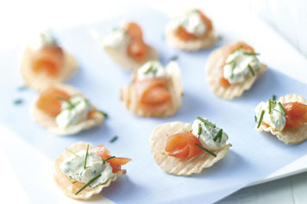 Roll each salmon strip into cone shape; place 1 on each chip. Top with cream cheese product mixture and chives. For best flavour, prepare cream cheese mixture ahead of time. Refrigerate up to 24 hours before using as directed.